Hot on the heels of Dating Bankers Anonymous comes "How to Marry a Millionaire", the perfect seminar for anyone fed up with their now cash-poor better halves, who want to upgrade to the real deal. Tickets are $380, which comes with cocktails and canapes -- a real steal if you think about the potential return on investment. Things you'll learn in the seminar: where to find a millionaire. How to get his attention. How to dress for a millionaire (methinks the less the better, but what do I know, I prefer to date blue collar). How to get him to introduce you to his wealthy friends if things don't work out between the two of you. How to catch his attention from across the MTR (now that's just odd PR -- the whole point of picking up a millionaire is so you don't have to take the MTR). And most important, how to get him to propose within six months. What's missing? How to get out of signing a pre-nup? Is this the death of romance? Or the birth of a new generation of practical dating? The seminar is hosted by an American speaker named Lisa Johnson-Mandell (note the hyphenated surname, YES you're married good for you), a lady who, incidentally, doesn't have experience in snagging her man on the MTR because she met her husband through an Jewish singles site. 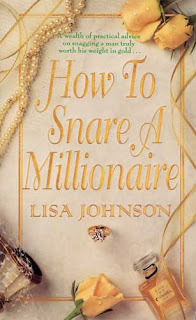 That said, she did author the book How to Snare a Millionaire, which is currently ranked #336,921 on Amazon, kind of a not-too-shabby ranking for what I would consider a very niche market. She also gives advice on Bravo TV's Millionaire Matchmaker, and although Bravo is not a network channel, that kind of indicates that this millionaire craze is a lot more mainstream than I previously thought. Sign up at the ironically named Get Smart.